Note on men’s sizing: My husband is a pretty solid US men’s size 10 with average-width feet. 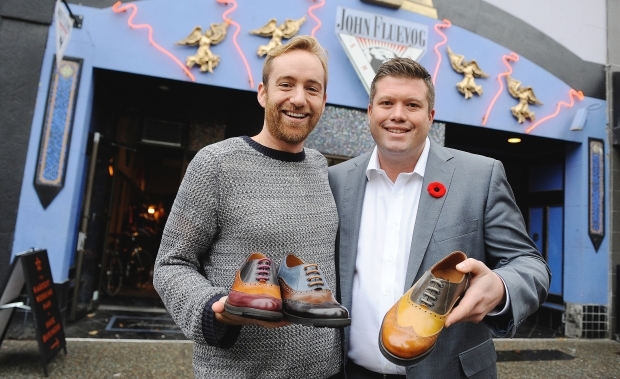 He has both the Value | Wisdom and Radio | CBC in size 10. I’m afraid I’m a little iffy with the sizing since I didn’t try on the shoes myself. Dealer Anthony helped us this time and he was wonderful as usual. If you have any questions about sizes, don’t hesitate to call any of the dealers. Here at FTLOV, we of course love our Melrose and Haight Street dealers, but call the store you feel comfortable with. Features | Dean in black. Size 10. One thing I’ve noticed is that the stock photos online don’t show the contrast soles true-to-life. These caught John’s eye because of the blue soles. He found the shoes to be very comfortable, probably because of the rubber soles and soft suede leather. He kept his eye on these even while he was trying on other shoes. Guardian Angel | Andrew in blue/burgundy/brown. Link to burgundy/orange/brown. Size 10. Just like the hero they were named after, these shoes are awesome. They are one of the handsomest shoes I’ve ever seen. John liked the look of these, but he didn’t find them to be as comfortable as the Deans. Also, I can’t figure out why this particular colorway isn’t available online. Perhaps they’re only available at the Melrose store, and perhaps just a few others? This colorway is my favorite out of what’s available, though. Beats | Sal in cognac. Size 10. Another incredibly-handsome shoe. That color is delicious. I wanted to lick these shoes when I first saw them!! TMI? Anyway, John has been looking for non-black shoes (after two black Fluevogs, he needs to diversify IMO), and he liked the look of these. However, he found the placement of the toe-cap edging too awkward for his toes. When he walked, the edging hit his toes/foot at an uncomfortable place. Alas. Arch Angel | Farmer in brown. Another instance of the contrast sole being brighter in real life than in the stock photo. These are gorgeous. John liked the sturdiness, but he said they felt a little too stiff, like they were squeezing his feet. Anthony assured him that the leather on these would soften with use. Twin Turbines | 1611 First Avenue brown/tan. Size 11.5. John finally wanted to try a boot, just to see what they feel like. He’s never had boots (aside from hiking boots and motorcycle boots that he’s never worn because he doesn’t have a motorcycle), let alone beautiful spats-inspired Victorian-style boots like these. This style must be popular in L.A., because they didn’t have any in or around John’s size. He tried on the 11.5 — too long — but he said that the width was fine. He definitely liked the look of these as well. Twin Turbines | 205 Pine St in brown/red. Size 10.5. Another Twin Turbine style that’s vintage-y and very spiffy looking. It’s definitely a good-looking family. John liked these but wished they came in a blue/brown combo (the navy suede were too much). I think this is a very nice colorway, myself. But did you guess? He ended up getting the navy/brown Brandenburgs. Yay!!! I was so excited. He really liked them but one of his reasons against buying them was that they’d only get worn once a year, if that. Given my large collection, I pooh-poohed that reason. He can wear them on the weekend instead of his usual CBCs, right? And if he wants to go shopping to build an outfit around his new shoes, I’m happy to help. Haha! I suppose you can understand why he said that it felt like I was getting the shoes for myself. AJ | Catarina in black/white. Size 6. Of course I couldn’t leave without trying on a pair myself. These had just come in a few days earlier. These high platforms definitely have wow factor. (And they have a matching purse!) I’d say these run a half size small because they fit me quite well. There’s barely any pitch, either, so it was like wearing very small heels. They’re quite stable, but of course you need to learn how to walk on what are basically stilts. They’re perfect if you want extra height in something eye-catching! I totally forgot to do a “flower” wheel (Fluewheel?) the last few times I’ve been at the store, so I’m very glad I remembered this time. Here I’m wearing the burgundy Qtees at the 9 o’clock position, and going clockwise: Anthony with the laceless navy/brown Brandenburgs (which look fantastic with his polka-dotted socks), Kate with her red CBCs, John with his black CBCs, and Miranda with her black vintage Vogs (I forgot the name). Btw, Miranda was last month’s creative masked Vogunteer! Next time, I’ll continue my Part III review of the women’s collection. Until then! Nota bene: what you should know about my sizing as you read my reviews. I am a true size US 5.5. I have relatively-flat arches, wide toes, and narrowish ankles. I regularly wear 5 in the Operetta, Mini, Attention, and Baroque families; 5 or 5.5 in the Bellevue and Fellowship families; and 6 in the Radio family. However, the sizing of certain styles within the same family can differ, and even the same style can differ in sizing from season to season. Less than a month since my last post and it’s already time for Part III? Yes, indeed! You can thank the upcoming holidays and my love of Fluegasms. 🙂 (Here are Part I and Part II.) I made yet another trip to the Melrose store last weekend with my dear friends Emily and Melanie, and we found a couple of exciting new styles. The point of the trip was for Melanie this time, and she ended up with her second pair of Vogs, which happened to be her wardrobe’s sole mate! 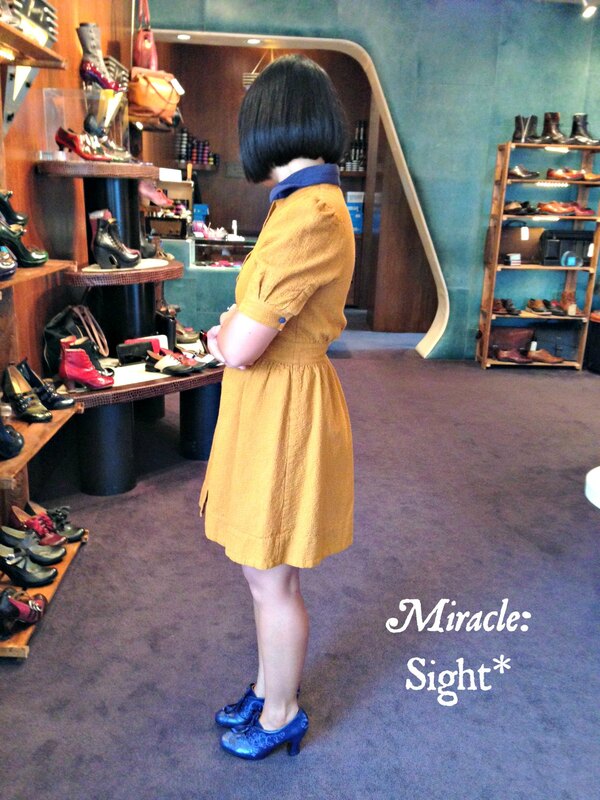 Miracle | Sight in blue. Size 6.5. 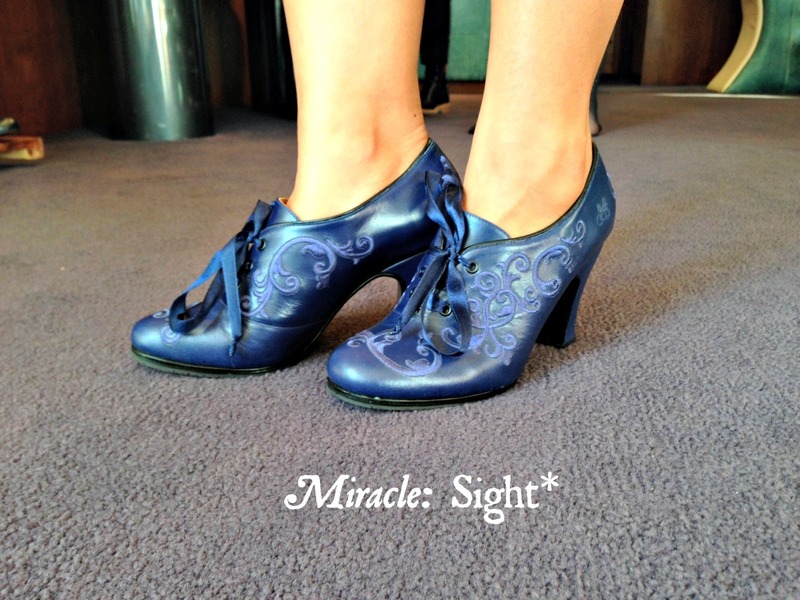 Miracle oxfords with gorgeous embroidery in TARDIS blue. Uh, you knew I’d be all over that, right?? Like with most Miracles, I have to go up a full size in these from my baseline 5.5 because they’re narrow and they run short. The Melrose dealers call this one “Only in L.A.” because yes, it’s only available at the Melrose store. AND THERE’S ONLY ONE PAIR EACH SIZE. 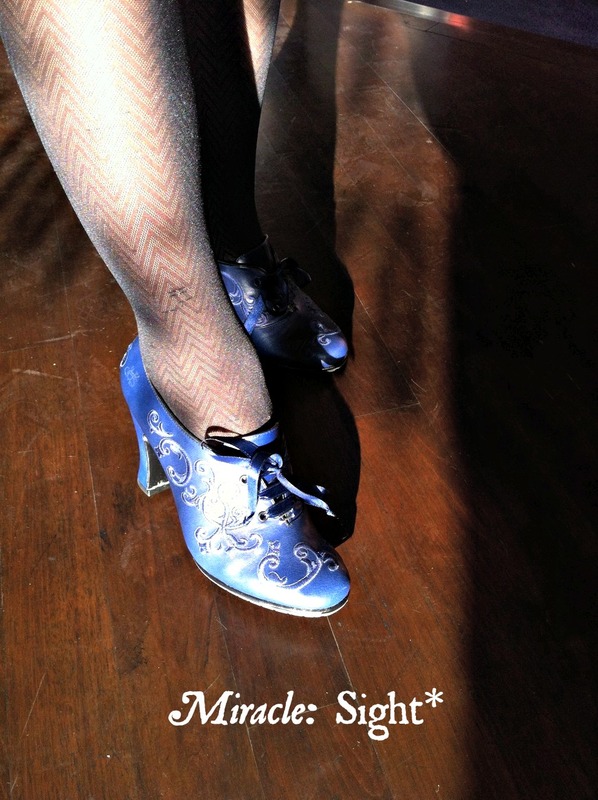 These aren’t available on the Fluevog website or in any other color, either, except on Amazon in black as far as I know (which are actually on sale for 20% off for Veteran’s Day, through Nov. 11, as are almost ALL other Fluevogs!! The Viv! The Rubens! The Liz! The Leader! The Elizabeth! Just sayin). And the asterisk * is for the fact that I’m not sure what these are called; they’re called Sight on Amazon, so that’s what I wrote here. (I should have asked the dealers. Sorry.) 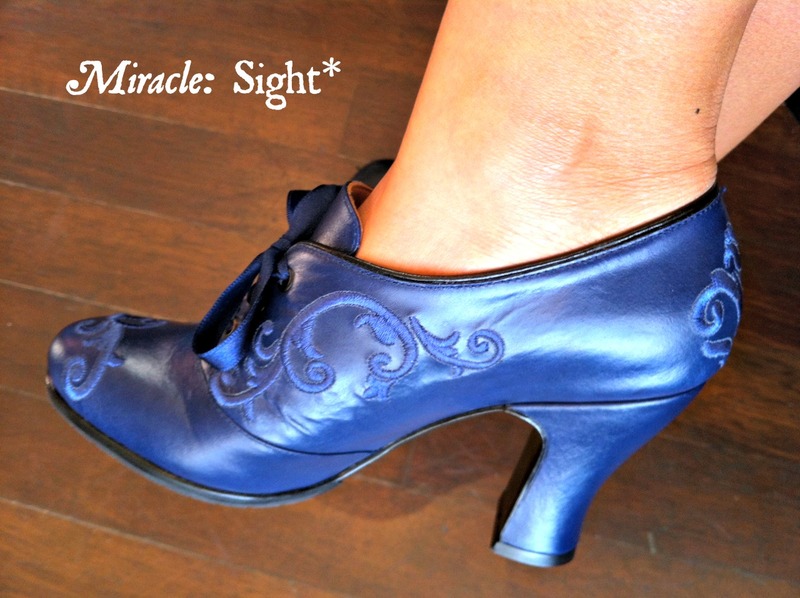 Here’s what dealer Anthony told me might have happened: one and half years ago, when Fluevog was selling its Fall 2013 collection to other retailers, this amazing blue oxford was one of the choices. One retailer ordered them but then decided not to carry them any longer. 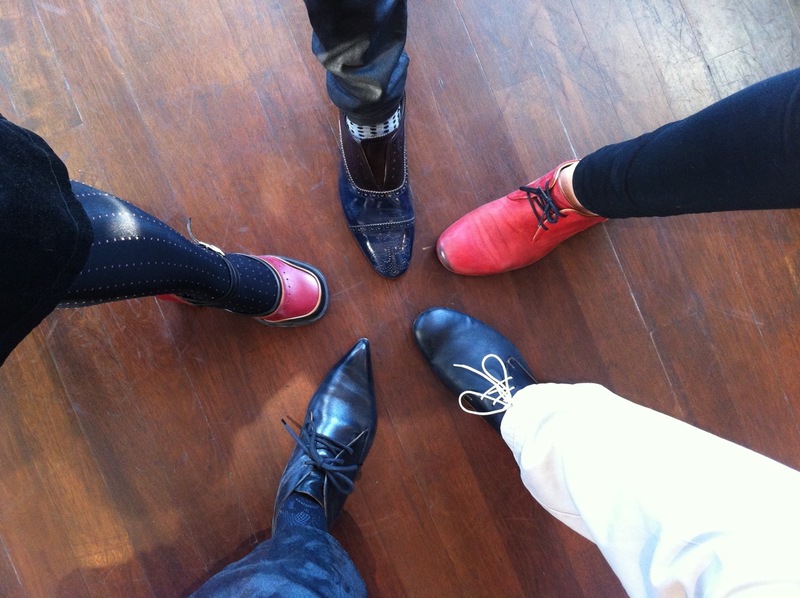 So the whole set got kicked back to Fluevog, and in its infinite wisdom, Fluevog HQ decided to send the shoes to the L.A. store. AND THANK THE GODS ABOVE. I apologize in advance to those who are my size because I now have the 6.5 on layaway. Call the Los Angeles dealers if you want these beautiful babies! Zion | Trinity in grey. Size 6. These are striking and very high heels! Emily called them architectural, and she was absolutely right (just read the description on the Fluevog website). Size wise, I think they run true to size, although the zippered vamp kept me in pretty well. They’re quite stable but you seriously need to know how to walk in high heels. The leather here is nice and soft, and I really love the colorway. The black-and-blue colorway is also very striking (in more of a dystopic, sci-fi way), but the leather on those is very stiff. I found it hard to walk in the black because it hit my ankle bones in an uncomfortable way with that stiff leather. I had a similar issue with the gray — it’s probably because I have such flat feet — but it wasn’t as problematic given the softer gray leather. Anyway, this style isn’t for me, but you can see how gorgeous it is. Well, that’s it for today, but I’ll post again very soon. We tried on so many styles from the Fall AND took another look at some worthy shoes on sale from last season. Some are repeats but it’s always great to see how the shoes look on different feet. Let us know how you like these new styles! Categories: FlueReview, Hot Vog Find, Vog Collected | Permalink.